Don&apos;t need to go through complex chemical lab tests be able to accurately obtain the water TDS value, simply put Mi water quality TDS detection in the water, press the switch button, the display will show the TDS value of water immediately, so that you know water purity. 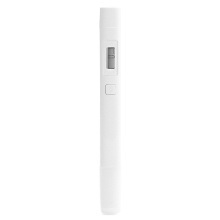 *XiaoMi water quality TDS test pen, accurate test the purity of the water quality at home anytime, it also determines whether purification is required. *Three kinds of impurities in water can be detected: soluble salts(calcium, magnesium), ionic organic compounds(Ammonium acetate, SIPE), heavy metal ion(Chromium, zinc, lead, copper). *The pen is IPX6 waterproof and has automatic temperature calibration and precision in measurement. *High precision: Anti-rust and anti-corrosion metal TDS probe. Detectable range of 0-9990. Low-power chip, auto power-off. *TDS is easy to carry and is widely used in: domestic water, beauty clubs, swimming pools, corporate water, fish farms and other fields.